Home / News / Politics / Paolo Duterte's sweet message to Senator Trillanes: "It is not revenge, I seek for justice." 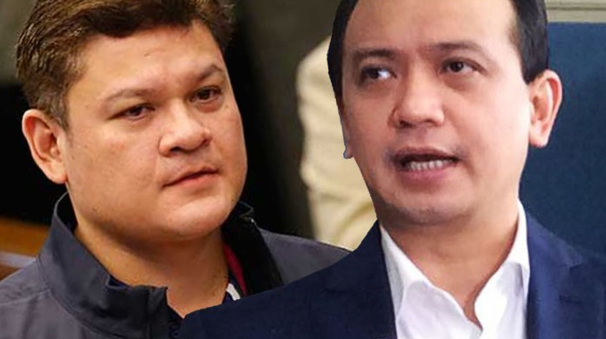 Paolo Duterte's sweet message to Senator Trillanes: "It is not revenge, I seek for justice." Presidential son and former Davao City Vice Mayor Paolo Duterte posted in Facebook on Saturday a message probably pertaining to Senator Antonio Trillanes for he is running for Congress in 2019 midterm elections. President Rodrigo Duterte on a speech in Papua New Guinea in front of the Filipino community he said his son Paolo Duterte will run for Congress to get back at Senator Antonio Trillanes IV. “I think he’s running for congressman kasi napahiya… hiniya ni Trillanes. He was summoned to Congress,” Duterte said. "Gaganti talaga ‘yan. He will be running for congressman, tabla sila dyan,” he added. 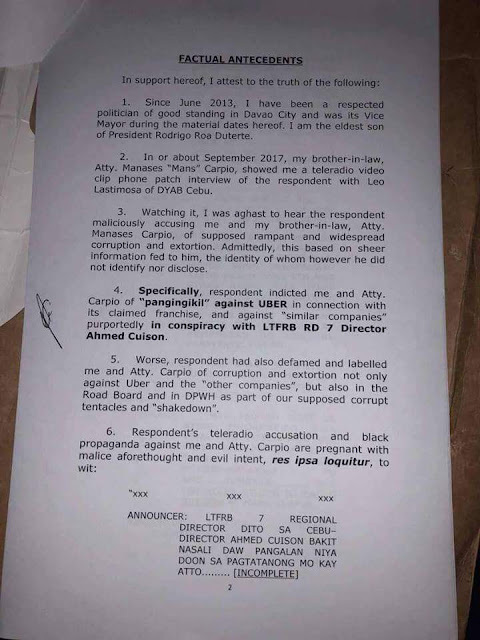 In 2017, Senator Antonio Trillanes accused Paolo Duterte of being a member of a triad in Davao. Trillanes alleged Duterte is "a member of the triad. Smuggling a P 6.4-billion worth at the Bureau of Customs. The senator said he received this information from an intelligence source abroad. The vice mayor and his brother-in-law, Attorney Mans Carpio, attended the hearing. Trillanes asked Duterte if he could show the alleged tattoo on his back that supposedly had the image of a dragon. Duterte said "No way!" with conviction in Senate hearing. Duterte invoked his right to privacy. Dakdak, See you in court! Finally, after more accusations on Duterte family, Paolo Duterte has filed a libel case against Senator Antonio Trillanes IV at the Davao Regional Trial Court. Based on the Article 355 of the Revised Penal Code, an accused, if proven guilty of libel, may be imprisoned and penalized with a fine that ranges from P200 to P6,000. Amid the statement of President Duterte of his son getting back to Senator Trillanes, Paolo has resigned last year citing his failed marriage with his first wife and his alleged involvement in the 6.4-billion worth of shabu from China through the Bureau of Customs. He filed his certificate of candidacy for Davao City 1st District representative with his sister Davao City Mayor Sara "Inday" Duterte. In his Facebook post, he get back to Senator Antonio Trillanes IV remembering what the Senator has done to his family. 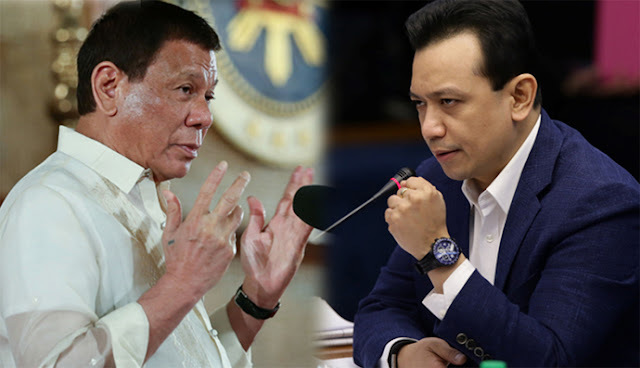 "Next year, Mr Trillanes will be worse than a non-matter. He will end his term as a senator like it is a blessing to the Filipino people — perhaps except for the few who believed in the lies he concocted against me and my family. As he is today, he will be worthless. I honestly do not seek revenge. What I seek is justice. I have filed cases against him and he should man up and face these cases in court. Apart from that, considering the insignificance and uselessness of Mr Trillanes, I will devote my time to serve the Dabawenyos."